It's the end of agencies as we know it. Agencies are no longer seen by clients as one-stop shops. According to pundits, the "Agency of Record" has died a slow and painful death. The claim these days is that agency services are modular. One agency to manage search, another for reputation management, another for PR. What's worse, the barrier for entry is so low almost anyone can start their own agency. The agency landscape is a convoluted mess. The upper echelon of agency life forces firms to complete large amounts of spec work. Clients approach agencies with a laissez-faire attitude. Do free work for the chance to win... more paid work. Spec work has trickled down via design contests. A cattle call that forces amateurs and professionals into the same muddy pen. As an agency you're forced to deal with a variety of depressing and incredibly unfair expectations (e.g. SEO agencies that guarantee rankings or traffic). What's worse, most agencies accept these disturbing changes. They don't do it because they have to, they do it because they can't keep the lights on if they don't. There's nothing special or unique about these agencies. Which is precisely why most agencies are abused and mistreated by clients. There's no way to tell agencies apart. So clients construct their own abusive set of rules to get the results they want from their agencies. The problems above, specifically hyperspecialization, mean clients are less interested in upsells, right? Clients care about the same things they've always cared about. Clients in general and decision makers in particularly don't care all that much about specialization. Most don't care about modular services or any of the other problems I've just mentioned. Does that mean these problems don't exist? It's tough to get clients to go for the big project or national campaign. It's not as easy to get a bigger piece of the pie anymore. These problems, specifically hyperspecialization, are getting worse. There's a growing shortage of knowledgeable experts. What we have here is a meta problem. Hyperspecialization is being touted as the wave of the future, but it's creating an even bigger problem. There will soon be a shortage of knowledgeable experts. Your clients need an advisor with an A-to-Z understanding of their situation. This is the situation for many agencies. Agencies are much more capable than clients realize. Agency typecasting means clients are far less likely to get the outcomes they actually want. Instead of relying on a few agencies with deep knowledge and a broad range of expertise (such as yourself), clients are cobbling large groups of "specialists" together. There are two common routes agencies can take. · Industry specialization: Focusing on a specific niche (e.g outdoor, financial or ecommerce review management) gives you a deep level of knowledge and expertise. · Service specialization: Deep specialty in specific service areas (e.g. crisis management, review outreach) means you’re able to attract clients in need of a very specific skill set. This makes it easier to establish genuine uniqueness. Generalize to keep your clients profitable and satisfied. 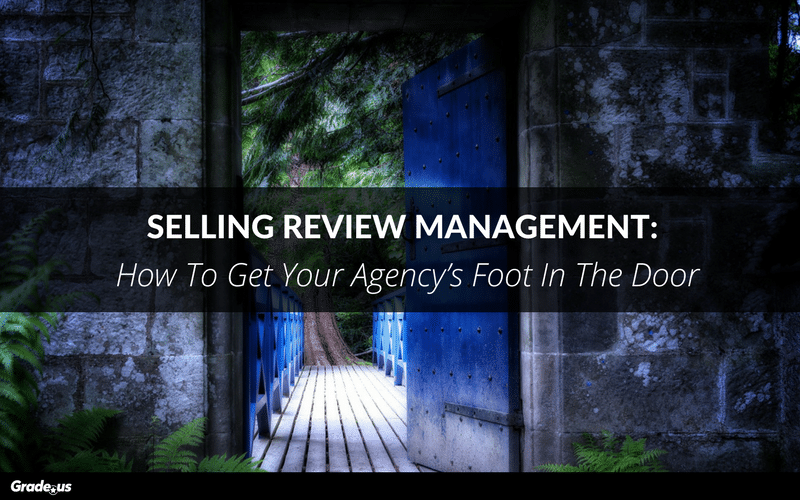 There are quite a few services you can use to get your agency's foot in the door. But the focus word here is quick win. If you want to attract your client's attention and work your way into a generalist role, you'll need to generate results quickly. Online reviews are clear. It's easy for customers to make the mental connection. The more reviews they get, the more customers they receive. It's simple and straightforward. Here's why we recommend online review management and marketing. · Reviews immediately boosts your client's conversion rates. Research shows 50 or more positive reviews translates to a 4.6 percent increase in conversion rates. Four or more negative reviews and your clients may lose as much as 70 percent of their potential customers. · A no/low quality review portfolio translates to significant drop in sales. 87 percent of customers won't even consider a business with low ratings. · It has mainstream appeal. Online reviews are ubiquitous. Most people understand the value of an online review. The easier it is to generate quality reviews, the quicker the win. · No extra/hidden fees. Clients don't have to increase their ad spend. They don't have to pay your fees on top of that. It's easy to understand so it's easier to sell. Online review management delivers clients quick wins. Attract more positive reviews and your client's conversion rate shoots up. Bury your client's negative reviews and their conversion rates go up. Promote positive reviews to your client's customers via advertising/remarketing and their conversion rate goes up. Get their existing customers to share their story and you have the potential to dramatically boost your client's revenue. With the right approach you can help clients 2x, 4x or even 10x their business. No other marketing channel offers such a dramatic lift in such a short period of time. It's a compelling reason for your agency to lead with online review management and marketing services. It's an excellent way for you to establish your agency as a trusted advisor, a role you can use to expand your role with each of your clients. Clients are hounded by pitchmen. Salespeople and marketing generalists who don't know their client's business. These pitchmen are focused on their needs rather than the needs of their clients. Clients have a dirty word for these pitchmen. Solicitors muddy the waters. They make it harder for you to get through to potential clients. The create fear, skepticism and distrust. How do you get an audience with potential clients? Step #1: Connect your client's online reviews to what they want. · Create a list of their negative reviews, along with a list of customers who are willing to update or modify their review. · Survey a statistically significant sample of your client's customers. Use tools like Qualaroo and UberConference.com to conduct semi-automated phone interviews. UserTesting.com or CrazyEgg to survey potential ecommerce clients. Step #2: Give clients an irresistible offer that's risk free. · Create a free tool that provides data on your client's online reviews. Outperform existing tools by creating a tool that's (a.) more in-depth (b.) better designed (c.) offers more data or (d.) creates more drama. · Offer helpful online review lead magnets in the form of checklists, worksheets and guides. Minimize the workload. Make your lead magnets practical and useful. · Create a custom reviewer profile, a helpful (quiz, tool, guide) that shows your clients which customers are most likely to write a negative review and which customers are willing to write a positive review. · Create an Online Review Profit Calculator. A free resource that shows clients how to calculate the potential lift to their conversion rate. It can be focused on every 10, 50 or 200 reviews. · Share a competitor performance survey outlining how client's competitors feel about their review portfolio, customer response rates and more. Step #3: Use the topic, online reviews, to build a relationship. Then ask for the sale. · Use education to attract clients. Educate customers with 10x content and you'll build a relationship. Maintain that relationship with more educational content and you'll build a database. · Convert clients with information. Create an FAQ to answer logistical questions and objections. Create bullet points, guarantees, bonuses, urgency factors and risk reversals. · Create an irresistible offer. Use your upfront research and your findings to create an offer prospective clients can't refuse (i.e. online review guarantee: 30 percent lift or we pay you X). Step #4: Use problems to create upsell opportunities. Use solutions to widen the gap. · Identify hidden or ignored problems. Continue to find the hidden problems clients are ignoring, avoiding or denying. · Offer clients a solution to new problems. Present clients with a solution to their problems, make it easy to accept your help and desirable to do so. · Present the problem to clients before your introductory offer is complete. Getting your foot in the door is simple, if you know what you're doing. Hyperspecialization isn't the end of agencies as we know it. Clients aren't fixated on specialization. Their focus isn't set exclusively on modular services. They're focused on the same things they've always focused on. Specialize to get your foot in the door. You can specialize by industry, product or service. Use industry specialization to become the niche expert in your space. Use online review management and marketing to deliver huge wins for your clients. Generalize, once you've achieved the results your clients want. Agencies are no longer seen by clients as one-stop shops. According to pundits, the "Agency of Record" has died a slow and painful death. You can be the exception to the rule. Specialize, then generalize and you'll find the end is just a new beginning.